Today was the last full day of our stay on Mount Desert Island, Maine. 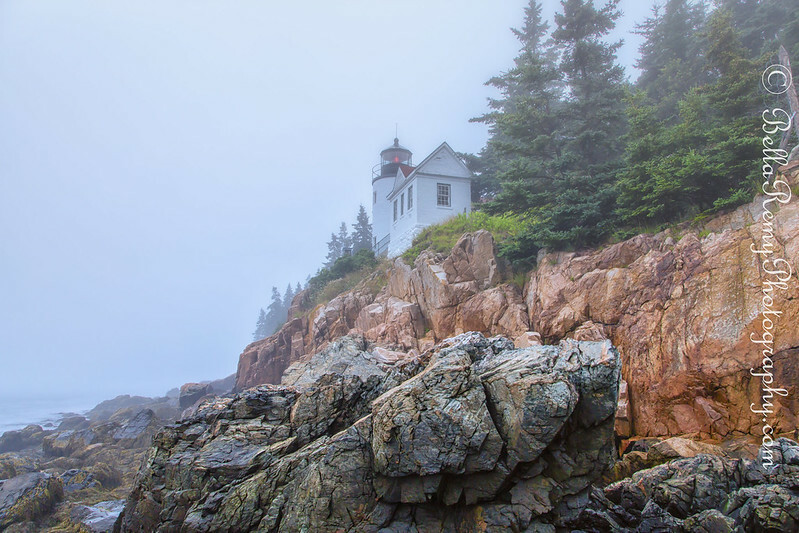 Staying on the “Quiet Side” of the island we’ve enjoyed the beauty and nature Acadia National Park and Maine has to offer without all of the tourists. Trails with few people, restaurants without crowds and a steady peacefulness watching life on the water. 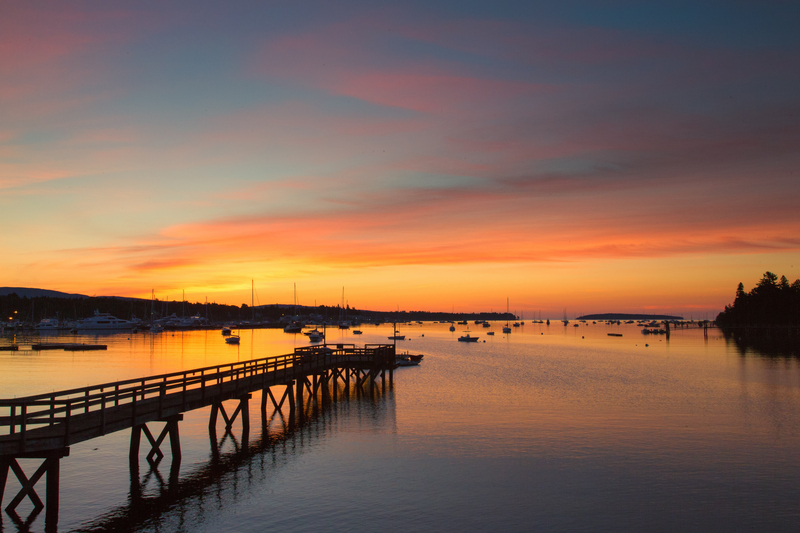 The sun rises early as the island is so far northeast in the U.S. to arrive pre-dawn required a 4:00 a.m. departure to arrive at Southwest Harbor to watch the sky begin to glow with the upcoming sun. Continuing south on Route 102, the road reaches the Seawall which is a natural rock beach filled with colorful granite. Another perfect place for a sunrise. A gull preened on a rock while the sun warmed his feathers. The beautiful golden light on the Seawall was spectacular and I practically had the place to myself. Leaving the Natural Stone Wall I continued on Route 102 south which wraps around and leads you to the Bass Harbor Lighthouse. 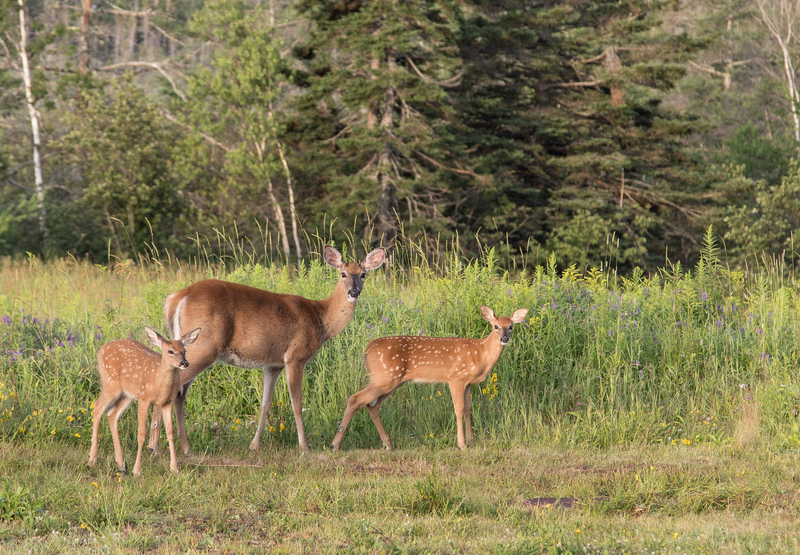 Along my way, good fortune was with me and I happened upon a Mama White Tailed Deer with her two fawns – still with their spots ! You have no idea how much I’ve been wanting to see fawns with spots this year. This certainly made my morning all worthwhile for such an early wake up call. The light hadn’t quite hit the lighthouse yet and I have a number of photos of the lighthouse from last year, so I’ll share one here. Continuing on, Route 102 brought me around to Bass Harbor, with the lobstermen leaving for a day of hard’s work on the water. It truly was a beautiful morning and I’m sad to leave the island so soon. Until next year MDI…I’ll be back! These photos are beautiful. 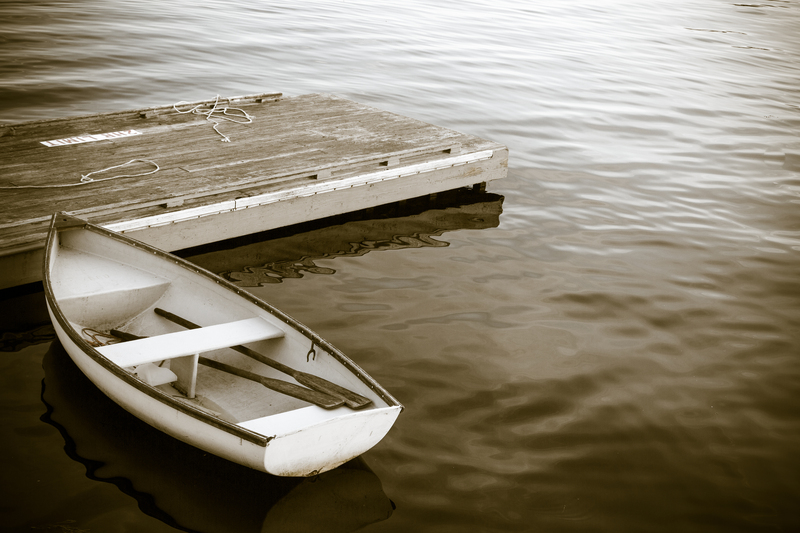 I especially love the colors and composition of the boat and raft/dock. Nice story, too. We are planning a visit to that area next summer, and then into the southern part of Nova Scotia. 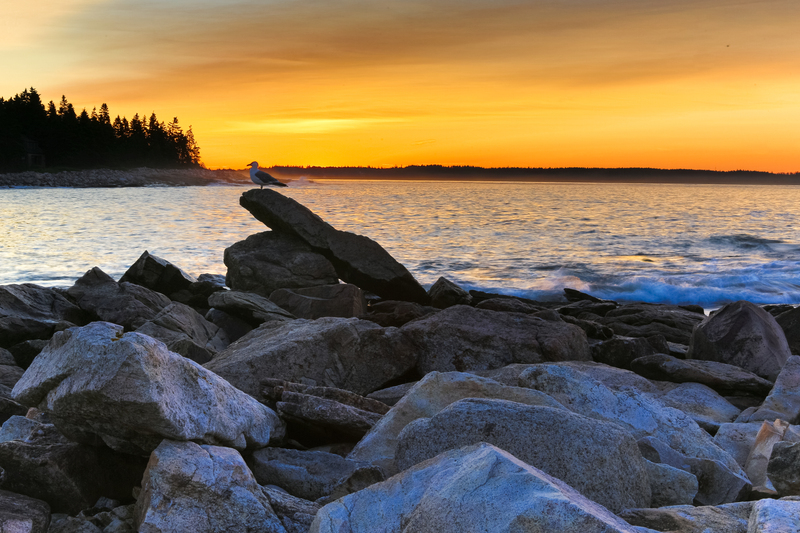 I’ll look for the quiet side of Mount Desert Island. I couldn’t believe how great that photo turned out too Pat. Yes, certainly stay on the quiet side of MDI. Think like a pair of lungs with Somes Sound in the middle. The left side – Southwest Harbor is the area to stay in. Hope you make it there. BREATHTAKING Captures – Happy Weekend 🙂 You finally made it outside again! Can you believe that many of the lighthouses on the U.S. eastern seaboard were sold to private owners about 8 years ago? I could have owned my own lighthouse. Beautiful photos!! I love the second one! Thank you so much ! Love hearing what people like best. Appreciate your visit and comment. Great post. You really captured the beauty of that wonderful island! It’s so easy to do if one slows down to drink in the scenery. You would love it there. 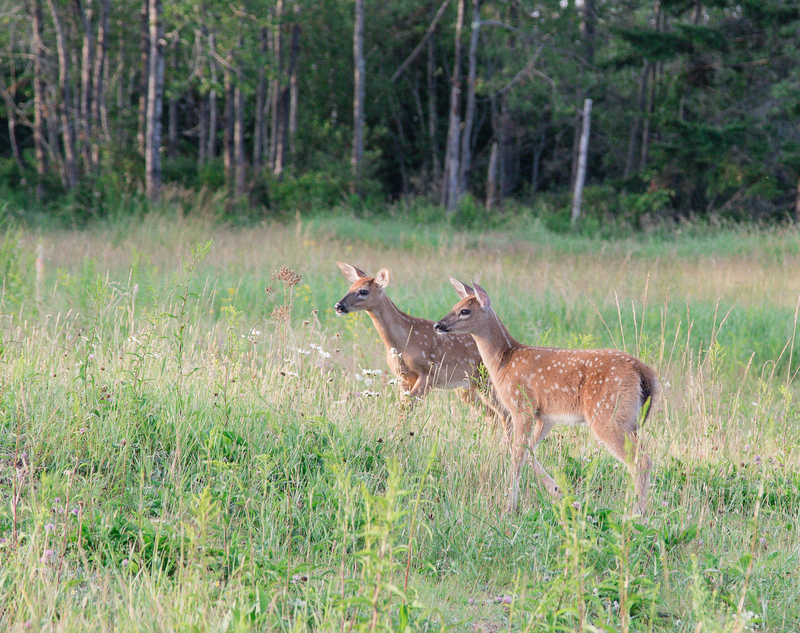 There you go, your spotted fawns, away from the ticks. You made me laugh out loud! Thank you so much Perpetua – now I’m thinking I may have Lymes too. Will see a specialist asap to see if that is true. Wish me luck and say a prayer for me. Glad to make you laugh. Please do keep us posted and will keep you in prayers. You are so kind Joanne – thank you for your well wishes. It worked well as we arrive safely home last night. Your time in Maine was all too short, I’ve been loving the photos that you’ve been getting! Wait a minute..2:03am? I know..work. But really? What a crazy hour. Me too, time way too short, not enough photos. I have a couple of other outings I didn’t get a chance to post, so don’t worry, you haven’t been cut off yet. Beautiful images. I am glad you got to see the deer and fawn. I am sure that must have made your trip all the more special. Happy travels! You know it did ! Now wait a minute – thought you were traveling. I am! I am using my new smartphone! I think Land’s End should consider you for their photographer! You are more than generous Denise. Certainly worth a try right? Truly too kind, thank you so much my dear. Emily, I just read through all your Maine posts from the past few days and I am sooo jealous. What a beautiful spot, and what gorgeous photos you got! 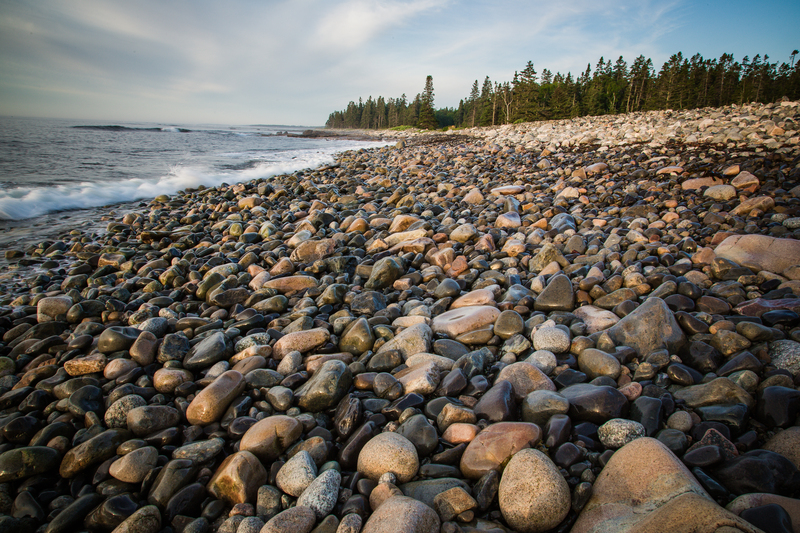 One of my favorite places on Earth is the Schoodic Peninsula, which is the only section of Acadia National Park that is located on the mainland. Haven’t been there in ages. : ( Are you going to be posting photos of the cars?? Great words & pictures! I haven’t made it to Schoodic Peninsula yet, which I’d imagine is glorious as well. Yes..cars will be upcoming. It’ll be hard to pick a few favorites though. Another set of spectacular photographs – wonderful sunset colors. Oh Mary, Maine was so glorious, and how I wish you could have been there with me. The colors, the nature, the wildlife. Hope you can get there soon.